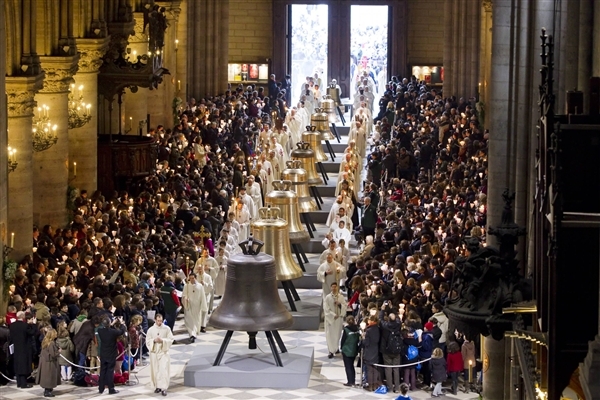 Let’s meet the Bells of Notre Dame! Weighting in at an impressive 13271kg and singing a lovely F#2; Meet Emmanuel, the leader of the group. Marie, the Glamorous one, weighs 6023kg and belts a delightful G#2. Gabriel, the Shy one, weighs 4162 kg and makes a sweet A#2. The Heart-breaker of the ensemble, Anne Geneviève weighs 3477 kg and omits an enticing B2. Denis, the Smooth one weighs 2502 kg and serenades the people with a cool C#3. Marcel, the Cute one weighs 1925 kg and makes an angelic D#3. Étienne, the Graceful one, weighs 1494 kg chants a magical E#3. Bad-Boy, Benoît-Joseph, weighs 1309 kg blasts a strong F#3. Maurice, the Heartthrob of the group, weight 1011 kg and charms the ladies with his seductive G#3. Jean-Marie, the Wild one, weights 782 kg and makes a daring A#3.